UNITY 2, Markes next generation thermal desorber, harnesses every technical innovation of the last ten years and incorporates every feature required for TD compliance. It provides the perfect platform for a state-of-the-art yet robust range of thermal desorbers with systems available at prices to suit every budget. Quantitative recovery of analytes from sample tubes can be validated using SecureTD-Q (quantitative re-collection for repeat analysis) per standard methods. ULTRA 2 adds to Markes' UNITY 2 TD platform to provide automatic desorption of up to 100 industry standard (3.5-inch) or DAAMS* (4.5-inch) tubes with or without RFID tags. The peerless analytical performance and key sample protection features of UNITY 2 features are maintained on series 2 ULTRA-UNITY systems. TubeTAG™: Reading/writing of RFID tube tags is now fully integrated with automated TD operation making it easy to track tube history. Patented DiffLok™ caps provide a uniquely effective tube seal pre- and post-desorption – preserving the integrity of sample and blank tubes. 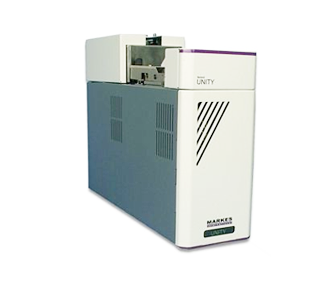 Quantitative sample re-collection (SecureTD-Q) is offered as standard on every series 2 ULTRA-UNITY for repeat analysis of critical samples and method validation. 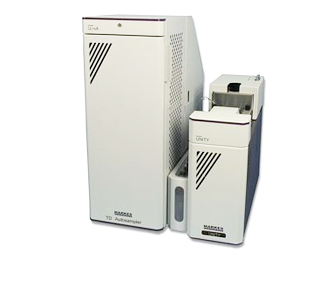 SecureTD-Q can be automated using one or two ULTRA 2 autosamplers. ULTRA-reliability – field-proven, mechanically-simple automation ensures robust operation. Incorporates the method-compliant leak test of UNITY 2, optional automated dry purging and optional internal standard addition for enhanced analytical quality assurance. Innovative, compact design – minimizes bench space. The Markes TC-20 tube conditioning system saves time and money, cleaning up to 20 industry standard (¼-inch x 3½-inch) sorbent tubes simultaneously. Unique flow control equipment built into each tube connection means that empty tube positions do not need to be blocked off if less than 20 tubes are to be cleaned. Using the TC-20 eliminates any risk of contamination of the analytical system and allows expensive helium to be substituted by lower-cost nitrogen. Stored without being properly capped. Heavily contaminated during a sampling procedure. Required for trace level monitoring. Some commercial thermal desorbers, like UNITY, ULTRA 50:50 and AutoSecure offer a dedicated tube conditioning mode. However this can lead to valuable analytical instrument capacity being used simply to clean sorbent tubes. Dry purging is used to remove excess water from a batch of sampled sorbent tubes. Dry purging is particularly important when hydrophilic sorbents have been used and eliminates the adverse effects water would otherwise have on MS, ECD and FID detectors. It also extends GC column lifetimes. 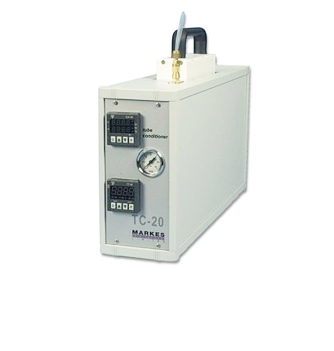 The TC-20 is used to pass clean, dry carrier gas through up to 20 sorbent tubes simultaneously. Tubes are inserted such that dry gas passes through them in the sampling direction at ambient temperature. As above, less than 20 tubes can be dry purged without needing to block off empty tube positions.